Chapel Hill, North Carolina makes up one corner of the Research Triangle along with Raleigh and Durham. Home of the University of North Carolina Chapel Hill campus, the town revolves around college basketball each season. While the university is the one of the biggest draws to the area, Chapel Hill has a lot of culture in the form of restaurants, live music, art, and history. Patrons come to the area looking for a variety of shopping from retail stores to a car dealer near Chapel Hills, NC. Whether you’re thinking of moving here or just visiting, you’ll find yourself immersed in a culture the likes of which you’ve never experienced. Universities seem to create a melting pot of cultures, and Chapel Hill is no different. You’ll find Asian fusion at Lantern, contemporary American food at Elements, authentic Italian at Il Palio, and Turkish dishes at Talulla’s. Experience a true microbrewery at Top of the Hill, which offers indoor and outdoor rooftop dining with an extensive menu that takes “bar food” to a whole new level. Get your Greek on at Kipos, fiesta forever at Fiesta Grill, and give back while you dine on Indian cuisine at Vimala’s Curryblossom Café where the owner and chef, an immigrant from India, feeds patrons whether or not they are able to afford a meal. Needless to say, bring your appetite with you to Chapel Hill. Chapel Hill offers many different theater arts for the spectator and the performer. Interested in theater but don’t take it too seriously? You’ll love DSI Comedy theater. Local comedians perform and classes are offered to the public to learn all types of comedy from stand-up to improv. PlayMakers Repertory Company is a local theater company showcasing up to six different plays from September to May. If the cinema is more your style, you have your pick of movie theaters in the area to catch the latest flick. There is always live music for your enjoyment at a variety of local venues. The Cave, Local 506, Memorial Hall, and Nighlight to name a few. Local musicians and even nationally known bands and artists have played in the bars and nightclubs in Chapel Hill. You never know who you might catch on any given night. Find a new group or an original sound that could become the next big thing. North Carolinians love shopping. Chapel Hill draws shoppers from all over the state who are looking for unique stores and great bargains. You’ll find local boutiques and shops of all kinds in downtown Chapel Hill, as well as shopping centers and malls in the greater surrounding area and in the nearby cities of Durham and Chapel Hill. Car shoppers looking for a car dealer near Chapel Hill, NC, will find Durham Volkswagen to be a great place to find a deal on a new or preowned Volkswagen, as well as a service center for those who need dealership servicing. 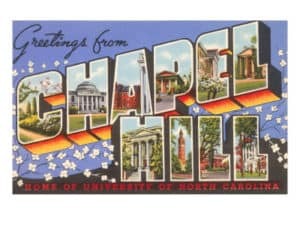 Come and see for yourself why so many visit Chapel Hill and choose to stay. Fully experience a southern town with delicious food, great music, and basketball. Plan your visit today.